I'd dreamed of becoming his vampire. When faced with death, in the last few moments of one's life, how is it possible to dream of something so beautiful that no reality, no matter how grand, would ever replace it? In Raven in the Grave, Marcus and Eleanor were crowned Dark Prince and Princess of Nevermore, a dream come true for the two fated lovers. It was supposed to be the beginning of their dark fairytale. 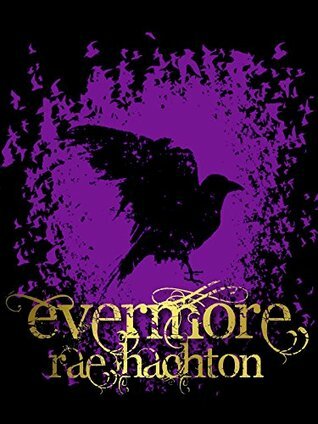 Now that Ellie has made her decision to marry Marcus and become a full Evermore, a shocking revelation threatens to destroy everything they've fought for. Her mortality stands in their way. What if she cannot become immortal? What if an event, far worse than any of them ever anticipated, shatters their world irreversibly? One last decision will have to be made: Marcus Marble must become a monster in order to destroy one. Whatever happens, one thing is certain—the consequences will be everlasting. Rae Hachton writes Dark Romanticism--sometimes with gears and clockwork. She has a cemetery obsession. Misses Victorian London and ancient Rome. Believes in vampires and magic. If imaginary, she would be an automaton fairy. Corvidophile. Content. "My Primary goal is to Scare you/Haunt you, but make you fall in love at the same time. I'm a Monster Lover who writes Dark Fantasy and Gritty Contemporary. Also a believer in dark and twisted fairytales and Scarily-Ever Afters." *No idea how many times I've talked about my love for this series or the final book on my blog, but I seriously cannot wait for the big conclusion to Marcus and Ellie's story. And at the same time, I'm sad that it is coming to an end. Still, October seems so far!! I actually haven't heard of this series before. I don't know how I missed it, I'll have to check it out! I hope you enjoy it! I wish a lot more readers had Pretty in Black on their radar. It really is a fantastic series. Hope you like the books when you get the chance to start them. I love the cover... sounds like a fab series too!